Our civic association held it's annual yard sale today. I was optimistic I'd be able to sell off some of the junk we've managed to accumulate since we moved in last summer. We had a bit of good news/bad news on that front. The good news was I sold some stuff. The bad news? My girls went to my neighbor, the amazing Miss Kat, and well...I ended with more stuff than I sold. I have a whole post planned later for the other things older than dirt that a 3 yo and 5 yo shouldn't be playing with goodies the girls snagged from her porch. 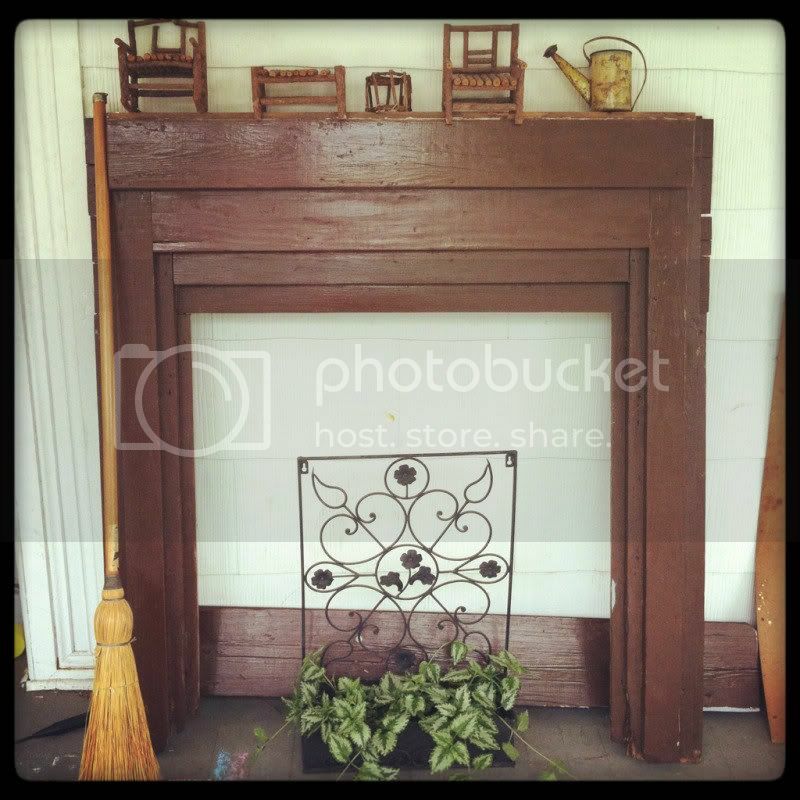 One of the items on my to sell list that didn't sell, was an extra fire place mantle. Because, you know, everyone just has one of those lying around. Along with the original bathroom sink to the house (didn't sell) and the cast iron fire place insert (didn't sell). And neither did my cocomotion. What is wrong with people? Anyway, I propped the mantle up against the front of the house. 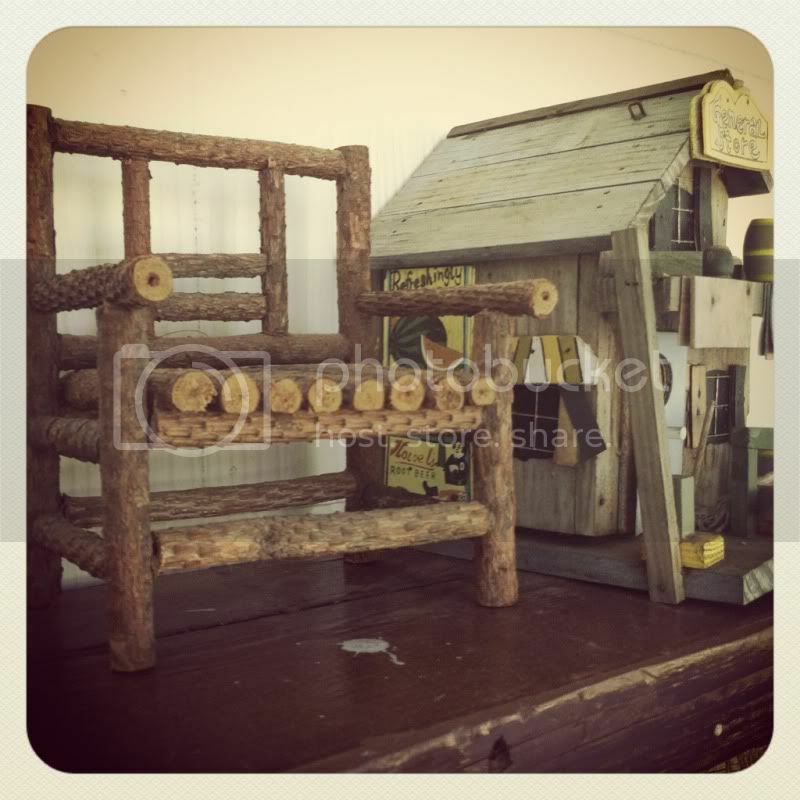 Then the girls brought over some little rustic folk art furniture. 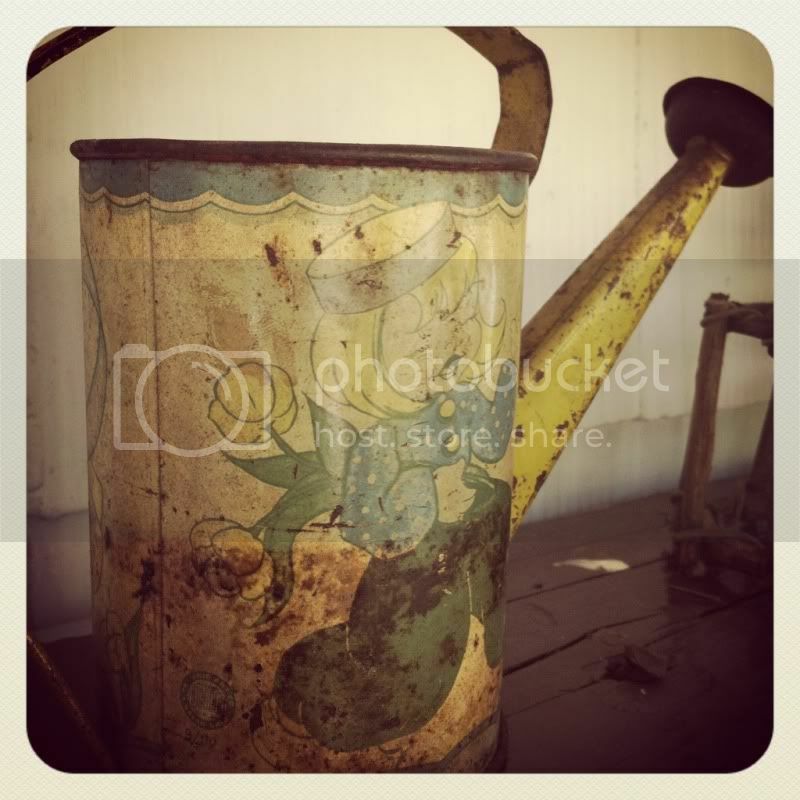 And an antique mini watering can. Then, Miss Kat brought over this plant in a planter (along with two varieties of mint, tarragon and lemon balm) because my front porch wasn't looking cute, I guess. About 20 minutes later, Little Miss comes running back from the neighbors with a handmade broom pretending she's a witch. Great. One more thing. I stepped off the porch and did a bit of a double take. Oh...my...gosh! I'm sort of glad it didn't sell. Now, I can be the weird lady with the fireplace mantle on her large covered porch that's all cute and everything. I may even change it seasonally. We added this cute little bird house at the end after I took the earlier picture. Actually, my girls went berry picking next door and she sent them home with the bird house AND a bowl full of berries. Thank you for linking this up at our Friday Block Party. What a cute fireplace! Ummm...maybe your kids should spend less time at the neighbors. I'd go nuts if my kids kept bringing stuff home that I had to find a place for. I'm trying to get rid of stuff! That's a super cute idea! Thanks for linking it up this week! It is adorable! Thanks for sharing with the newbie party. Always fun to see what everyone is up too. I love that you now love your mantel! That is so cool how it literally fell into place as your new porch decor. I think you should totally change out the decor seasonally. You can be the lady with the stocking hanging from the fireplace on her porch. I bet you'll start a trend with our friends at the Show & Tell party. Thanks for linking up. What a good idea for an old mantel! Thanks for sharing at Beautify It Monday! I love that mantle! What a fun idea to keep it on your porch and decorate it for the seasons! 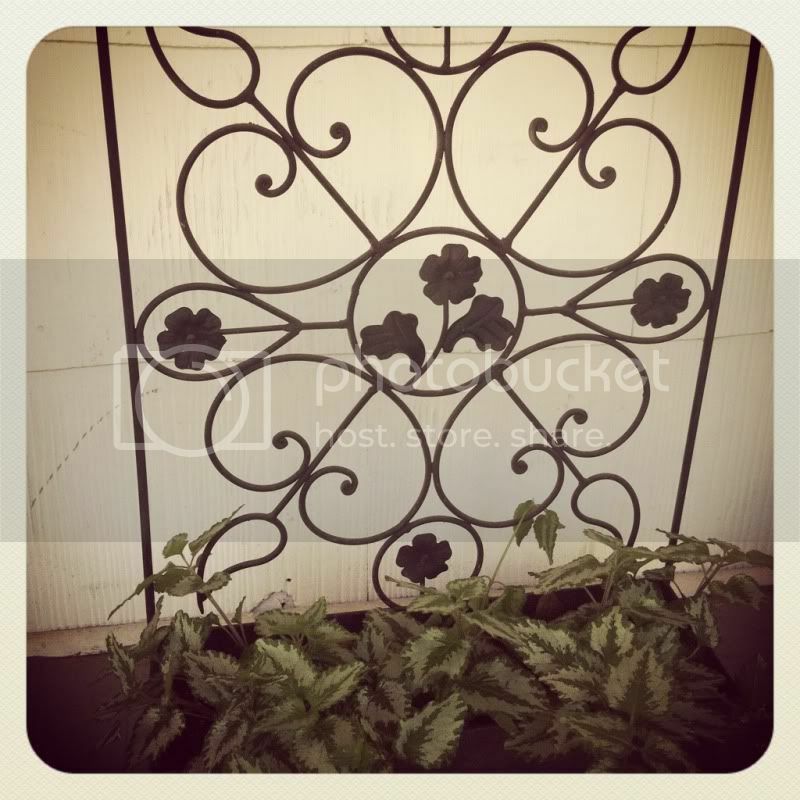 love the little planted scrolly metal work! I've been looking for something similar to hang behind our wood burning stove to add character...right now there is a yucky brown /faux wood metal wall cover... What ever I get I hope it's as cute as yours! see ya! have a blessed weekend. Perfect!!! I'd love to have you share at my party...it JUST opened!! !